June in Buffalo 2012 call for scores announced! Presented by the Department of Music and The Robert and Carol Morris Center for 21st Century Music, June in Buffalo, a festival and conference dedicated to composers, will take place from June 4 -10, 2012 at the University at Buffalo. June in Buffalo offers an intensive schedule of seminars, lectures, workshops, professional presentations, participant forums and open rehearsals as well as afternoon and evening concerts open to the general public and critics. Each of the invited composers will have one of his/her pieces performed during the festival. Evening performances feature faculty composers, resident ensembles and soloists renowned internationally as interpreters of contemporary music. 1. A résumé or curriculum vitae detailing your education, experience, and creative activity. 2. A letter of reference from someone acquainted with your current compositional activity. Proposals with electronics or multimedia will be considered. Included with the proposal should be a brief description of the work that includes title, duration, full instrumentation, and any technical requirements. Proposals for works in progress will be considered. A portion of the score plus the description listed above must be included with application materials for in-progress works. 4. One or two supplemental scores that demonstrate your recent work and accompanying recordings, if available. 5. A $25 non-refundable processing fee. Checks or money orders should be made payable to June in Buffalo. Foreign applicants must pay by international money order in US currency. Do not send cash. 6. An e-mail address at which you can be easily contacted and a Self Addressed Stamped Envelope (optional) for the return of application materials. To apply as an auditor please send a resume and the processing fee. Auditors attend all June in Buffalo events, but will not have a piece performed. On-campus housing includes single occupancy room for 7 nights. Food not included. University at Buffalo Faculty member Tom Kolor is quickly becoming one of the country’s top specialists in late 20th century American percussion music, and regularly commissions and performs repertoire from contemporary American composers at festivals in the U.S. and abroad. Tom has a lot coming up in the months ahead: festivals and performances in Europe, several recordings to be released featuring works by Milton Babbitt, John Cage, Louis Karchin, and Jeffrey Stadelman, and a string of residencies in universities throughout the U.S. and a self-presented concert series in New York City. Tom is looking forward to being a featured performer this summer at the Sound Res Festival in Leche, Italy, where he will give the European premiere of Marimba Variations by Charles Wuorinen, a sophisticated 15 minute-long Marimba solo he commissioned from the composer. Marimba Variations will be part of a larger program of contemporary American music for solo percussion, which will include works by Babbitt, Shapey, Carter, and Cage. Some of the pieces Tom will perform at the festival will be included on a full-length solo CD recently recorded at Slee Recording Studios. The album will include several percussion works by contrasting American composers Milton Babbitt and John Cage, and weave together their divergent aesthetic outlooks and unique voices – the former being the pioneer of American serialism and the latter the pioneer of American aleatoric music, graphic notation, and a variety of experimental approaches to music that form the foundation of American experimentalism even today. Tom drew inspiration for the repertoire on the album from a quote by John Cage where he remarked that he preferred, “music with too many notes, or music that had not enough notes.” The album will be available on iTunes in Spring of 2012. 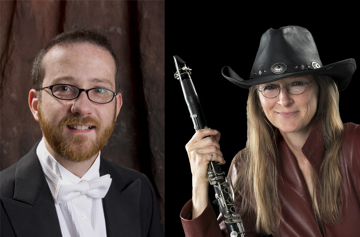 University at Buffalo clarinetist Jean Koperrud joins Tom on an upcoming CD, entitled Rated X, which consists entirely of commissions the duo commissioned from contemporary composers. The commissions all push the boundaries of contemporary music and demand intense instrumental virtuosity. The CD includes Louis Karchin’s Evocations, John Aylward’s Twin Suspension, Mathew Rosenblum’s Throat, and Yiorgos Vassilandonakis' X-asti, and University at Buffalo composer Jeff Stadelman’s wills & wonts. Check in shortly with Albany Records here for the upcoming release. Tom Kolor is also a member of the NYC-based percussion septet, Talujon Ensemble, whose concerts have been hailed by the New York Times as "frenzied explosions of percussion madness." Recently Talujon celebrated 20 years of performing contemporary percussion music with two 20th anniversary concerts at Roulette in New York City. The concerts showcased a world premiere of a new piece by Alvin Lucier entitled For Kettle Drums. Tom met Alvin Lucier when he performed Lucier's Silver Streetcar for Orchestra at the June in Buffalo festival several years ago with the composer in attendance. The encounter led to the commission of For Kettle Drums, which includes four percussionists on timpani with their feet constantly performing on the glissandi pedal to produce ‘beating,’ a fascinating acoustic phenomenon characterized by the shimmering effect of two pitches in a close, microtonal relationship to each other. Alvin Lucier worked closely with Tom and the other percussionists while developing the technique for the percussion genre, perhaps the first time percussion instruments have produced this strange effect. This Spring Talujon will present a concert series in New York City for the 100th birthday of John Cage, check Talujon's website for details on their upcoming events and CD releases. As active as they are commissioning and recording, they will also be touring the U.S. and holding residencies this spring at Brandeis University and the University of Nebraska. The Robert and Carol Morris Center for 21st Center Music is excited to host the Talujon Ensemble on April 23rd for an afternoon of student composer readings and a concert the following day, featuring Gerard Grisey's expansive masterpiece l'noir de etoile.